Be the first to share your favorite memory, photo or story of Alyce . This memorial page is dedicated for family, friends and future generations to celebrate the life of their loved one. Alyce Joy Ludvigson, the daughter of Casper and Margie (Snider) Ludvigson, was born on August 28, 1935 in Madison, Minnesota. During high school she enjoyed her time as a cheerleader. She graduated in 1952. She worked for 32 years at the Floyd County Memorial Hospital. Alyce was united in marriage to Bobby Hocking on December 10, 1955 in Fontana, California. 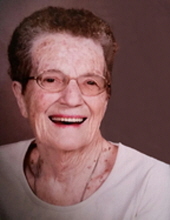 She was preceded in death by her husband of 63 years, Bobby Ray Hocking in 2015; parents, Casper and Margie (Snider) Ludvigson; parents-in-law, Clara and James Hocking; brother, Casper Ludvigson Jr.; brother-in-law, Doug Gearman; aunt, Mildred Huster; and nephew, Lonnie Ludvigson. To send flowers or a remembrance gift to the family of Alyce Hocking, please visit our Tribute Store. "Email Address" would like to share the life celebration of Alyce Hocking. Click on the "link" to go to share a favorite memory or leave a condolence message for the family.